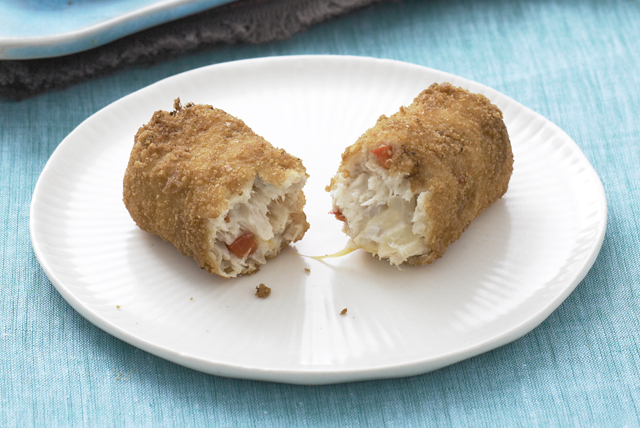 Crushed RITZ Crackers make the crispy coating for these flavorful appetizers. Cook first 3 ingredients in skillet sprayed with cooking spray on medium-high heat 10 min. or until onions are tender, stirring occasionally; cool. Mix with potatoes, tuna and cheese. Shape tuna mixture into 12 (3-inch-long) logs. Dip in egg, then roll in cracker crumbs to evenly coat all sides of each log. Heat oil in large saucepan to 375°F. Add tuna logs, in batches; cook 6 min. or until evenly browned, turning occasionally. Drain on paper towels. Serve warm. For best results, use chilled leftover mashed potatoes. This recipe also makes a great main dish. Each serving is about 3 croquettes. Serve with aioli, a garlic-flavored mayonnaise.